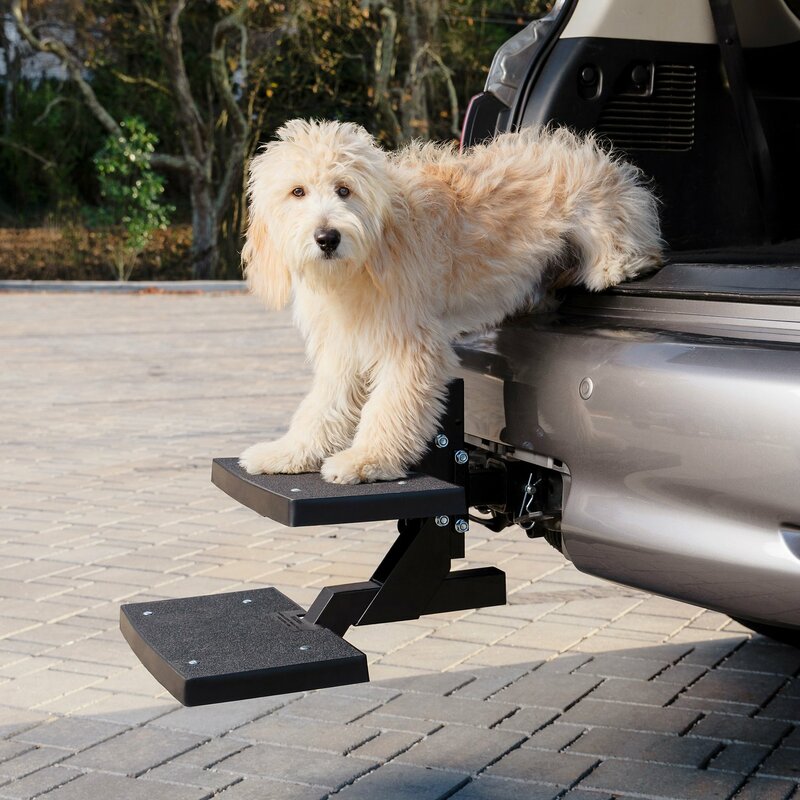 Taking your big dog along for the ride has never been easier with Solvit PupSTEP Car Hitch Pet Step. It’s the perfect solution for pet parents who want an alternative to large ramps for helping their pups access the back of the vehicle. The innovative two-step design makes it easy for pets to climb up and down, and even easier for you to swivel it up and out of the way when not in use. The generously-sized steps have a high-traction surface to give pets confidence while going up and down, perfect for all pets, especially those with joint and hip issues. Steps are 18 inches wide and 10 inches deep, and the vertical space between steps is 8 inches. Solvit PupSTEP Car Hitch Pet Step easily installs in any 2" vehicle hitch receiver and can be adjusted to fit the height of your vehicle. An easy solution for taking your big dog along for a car ride for pet parents who want an alternative to a car ramp. Innovative two-step design makes it easy for pets to climb up and down, and even easier for you to swivel it up and out of the way when not in use. Durable steel construction supports pups up to 200-lbs, and large steps with high-traction surface allows pets to easily get up and down. Especially great for pets with joint and hip issues! 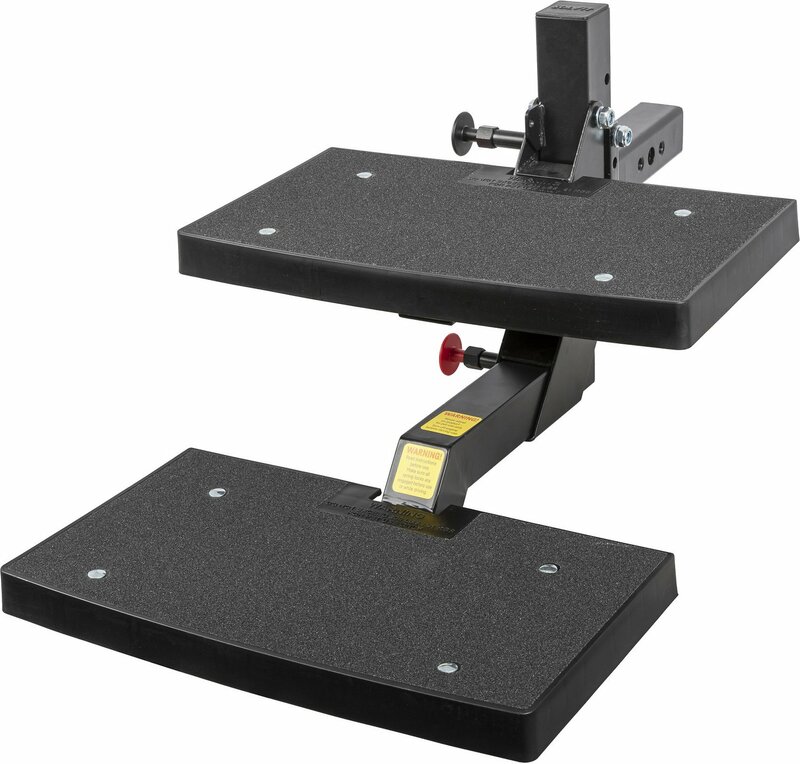 Easy to install in any 2-inch vehicle hitch receiver, and can be adjusted to fit the height of any vehicle. Vehicle liftgate can still be opened with the steps in the stowed upright position, and steps can be easily removed for storage. To avoid injury, always maintain control of the steps when raising and lowering. Periodically check all bolts to make sure they are tight. If you have connected the hitch insert using the 3 5/8 inches bolt, make sure the “R” clip is installed. Spray unit with a strong jet of water to remove dirt and other road debris. Remove steps before entering a drive-through car wash. 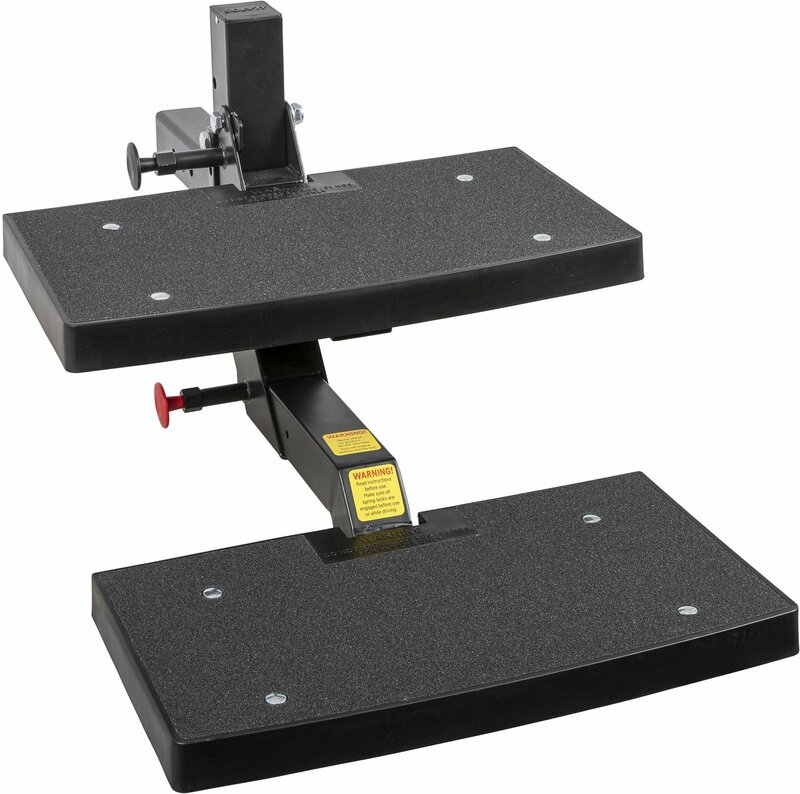 This step easily attaches to the trailer hitch. Our dog loves them and they help him get in and out of the jeep. I think they would only work for a larger dog because they are fairly high off the ground. If you have a jeep with the spare tire on the back, the first step easily removes so the steps fold up. The step is easy to take on and off. If you don't have the spare tire, the steps would probably be even better because the top step wouldn't need to come off. Love these steps!! OMG..... I am so glad we ordered this step system... Not only was it easy to install but our 5 3/4 month old puppy learned to use it in 1 day!! ... and our Dachshund is using it too!! The steps are easy to use and the dog had no trouble with them. The product seems to be well constructed and should hold up for a very long time. Very happy with these steps. Very pleased with the quality and ease of use of the Solvit PupSTEP! This does just what I wanted it to do. My Lab pup can make the jump into and out of our Expedition but I could see where it’s going to be hard on his joints over time. Now he climbs up and down the steps with ease. I wanted something for my 60+ pound dog to get in and out of the back of my Kia Sorento. We're working on getting him used to the steps. He's trained in agility so I am confident we'll get there. However, I wouldn't recommend this for all breeds or ages. Also, the hitch step interferes with my back up camera. I've tried with and without the steps, doesn't matter - constant beep and sometimes the camera won't turn on. I'm not convinced this is for every car/SUV. I think Solvit has a nice product; however, they should focus it for a subset of vehicles. Also, it would be helpful to have some training tips. I would recommend this with caution. I am pleased with the quality, ease of installation and ease of use. The steps have a good surface so the dog doesn't slip. My only problem is the width distance of the steps. There is only about a 5" differential between the top and bottom steps. My two 85lb Shiloh Shepherds are too long to use both steps. They will hit only one on the way up and down. I probably could have gotten away with a single step type. The product itself is good quality though and would recommend for smaller dogs. I love these steps for my SUV. With treats and encouragement, my dog quickly learned to use them. The steps save me from constantly having to carry and set up a ramp. Ramps take up cargo space too. I do take off the steps at times. It's just one bolt. These steps are SO worth preventing joint issues for my dog. I highly recommend them! My lab wouldn’t jump up into our Tahoe as soon as I installed this it took less than 2 minutes to get him up and down on it. We can leave it installed and the rear hatch open and closes. Installed a hitch lock so someone can’t steal it. Great for lower cars & SUV vehicles quality well made. Hi we have a Saint Bernard & 2yr English Mastiff they are just two large to handle this awesome step. This is really well made and quality. It's rare to find items this well made. I do believe our Yukon is too high off ground for this to work with our two big breed dogs. Our dogs need something wider to be able to see it with their wide leg span and body. A medium breed would do really great with this. I wish we had it when we had our labrador.